Our surf camp here at SwellWomen is designed to be accessible—we scour the world’s best surf spots to find waves that are friendly (no jagged reefs or double overhead barrels!) and then wrap a package of bliss (massage, healthy food, luxury accommodations) around those breaks to give you a one-of-a-kind surf experience. That said, surfers with a moderate level of physical fitness tend to feel more confident in the water. To that end, we’ve assembled these 5 surf-specific exercises to incorporate into your work out prior to your surf camp or surf trip. Not only will these moves make you a stronger surfer, they’ll also help you look pretty darn good in that bikini! Swimming. The single best way to prepare physically for a surf trip is to swim, swim, swim. Like paddling, swimming requires strong shoulders, back and arm muscles to power you through the water. In addition to building up those important muscle groups, swimming improves cardiovascular stamina and speed. If you’re new to swimming for exercise, try getting in the pool 2-3 times a week for at least 20 minutes. As you start to build strength, you may want to try a surf specific swim workout that incorporates sprints and distance sets. Here are a couple of recommendations from Surfline and Surfer Today. The key thing all of these workouts have in common is mixing up your speed and effort! Plank. Your core muscles are the foundation of your body, and building core strength will help your balance and overall performance on the surfboard. The front plank is a simple exercise that can be done anywhere. Focus on proper form (check out these tips) and start by holding your plank for 20-30 seconds. Gradually increase your time to 2-3 minutes. If we had to pick just one exercise to prepare for a surf trip, this would be it! Push-ups. Here’s a little secret. The process of popping up and catching a wave is a tiny percentage of your surf session. Most of your time will be paddling and waiting around in the line up for the best waves. However, when your wave comes, you will need a burst of power to get yourself up and riding that wave! Push-ups will help build the strength you need to execute a flawless “pop up.” Try starting with 2 sets of 10, and see if you can build up to 50 push-ups. Squats. Any form of squat or lunge (and ideally a mix of various forms) will help prepare you for surfing. Once you’re up on that board, your lower body strength will help you keep balanced and steady. You never see surfers standing straight and tall on the board—they’re always in a balanced, athletic ready position. The stronger your legs, the stronger you will be on the board! A simple front squat is a great place to start. For more advanced moves, try single leg squats or lunges, or work in a couple of jump squats to add in a little extra cardio! Yoga. 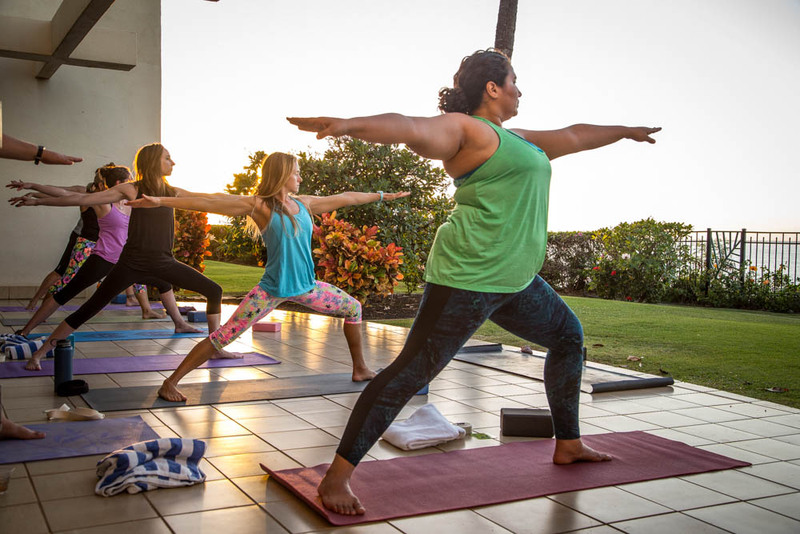 There is a reason we incorporate yoga into all of our retreats—it is the perfect complement to the sport of surfing! Even world surfing champ Kelly Slater practices yoga regularly. By incorporating a regular yoga practice into your pre-surf training, you’ll be way ahead of the game in terms of strength, balance and flexibility.